Home » Blog » AVG Tuneup Review: Is It Worth the Price? Important note: this kind of software is not intended for recently installed operating systems. They specialize in old computers and systems and help them to live up to their full potential. So, if your device’s performance leaves a lot to be desired, you’ll be pleasantly surprised by what TuneUp can do. It is a very intuitive, easy-to-use, and relatively cheap product. Let us go ahead and talk about every single thing it can do for your OS. 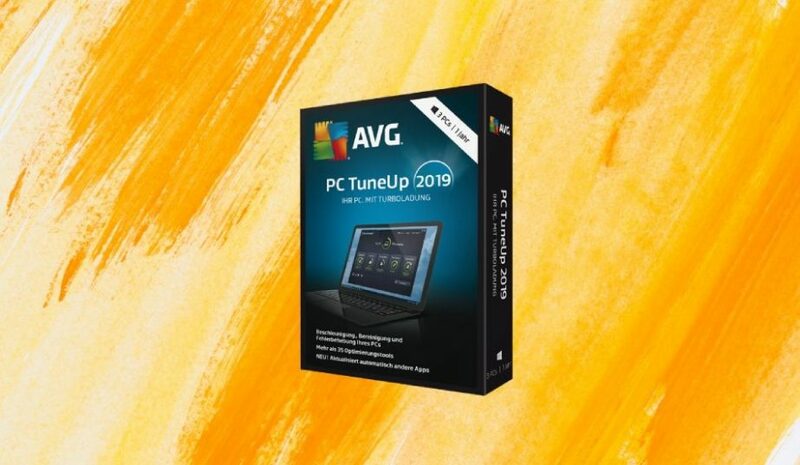 What Does AVG TuneUp Do? To put it simply, this software is a combination of several tools that specialize in different things. Auto maintenance, PC optimization, freeing up hard-drive space, and fixing general problems – that’s what TuneUp is good for. It is important to say that most of what TuneUp does can be performed manually. But, that will take up a lot of your time, and with auto maintenance, everything will be done without you even knowing it. On the dashboard, you’ll see four menus that can be accessed with one single click. The list includes Maintenance, Speed Up, Free Up Space, and Fix Problems. All Functions allows quick access to specific tools that you need at the moment. Besides, you can pick between several battery-saving modes, switch to the Airplane mode, and also revert any changes made by this software. This section does exactly what the name suggests – maintenance. If you don’t have time to scroll through every available option, Maintenance will take care of everything in a matter of seconds. It will ensure that no hard-drive space is being wasted on browser data, system logs/caches, and so on. Also, this tool is capable of speeding up the system’s shutdown and startup times. Older computers and operating systems can take forever to start. 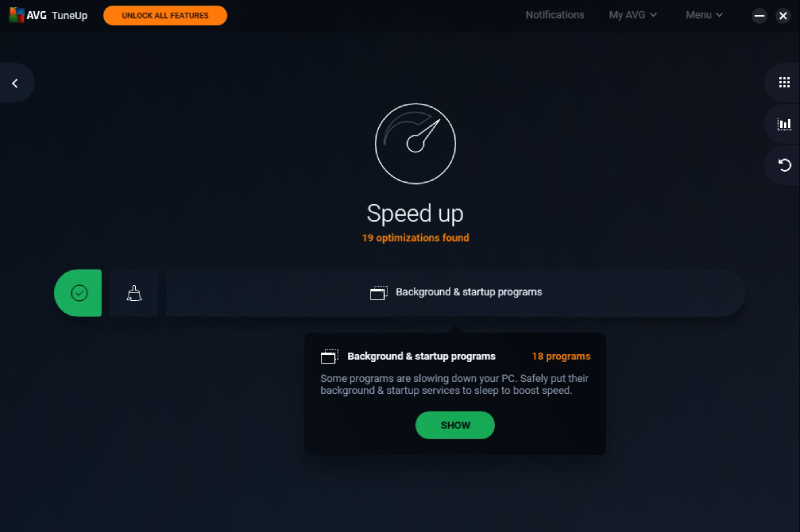 That’s why this feature is the most popular one in software like AVG TuneUp. You’ll instantly feel a change for the better once you use Maintenance and restart the PC. A quick note: owners of SSDs won’t feel a significant difference since this option is intended for systems running on HDD. Registry Issues – the tool scans your system’s registry in search of invalid references and incomplete entries. System Cache/Logs – scans the OS for temp files and offers the user to delete them (to free up space on the drive). Broken Shortcuts – find shortcuts that lead to moved/deleted files and folders. Disk Fragmentation – runs a quick scan to check whether your local discs need defragmentation or not. Browser Data – a similar feature to System Cache/Logs. It frees up the browser of unnecessary files. Works with Chrome, Firefox, Safari, Explorer, and Opera. There are numerous free speeding up tools on the Internet, and some of them are quite decent. 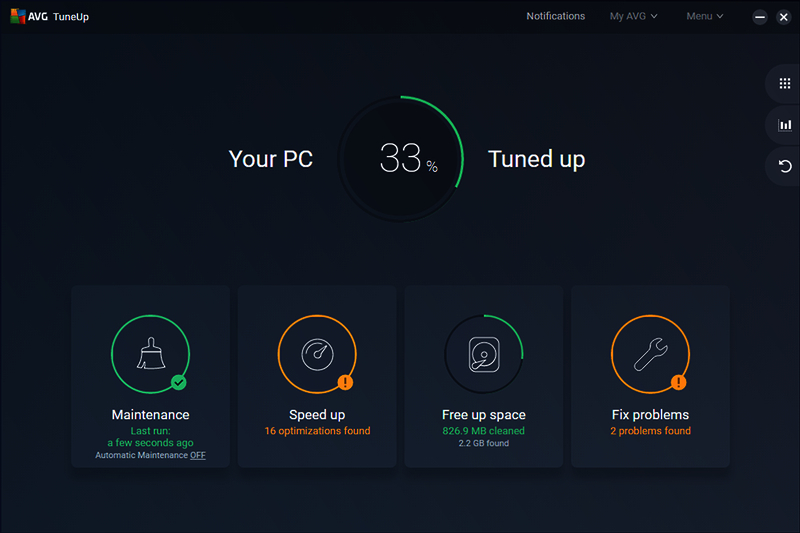 Is AVG’s TuneUp significantly better, or is it just another “magical” optimizer? Sadly, real-world tests run by our team and third-party experts prove that it’s not nearly as good as the developers claim. According to AVG, they achieved a 77% increase in speed, 117% increase in battery performance, and freed up 75GB of hard-drive space. We couldn’t achieve similar results; still, it’s way better than any free tools and will make your system work faster. Live optimization is one of the most significant reasons to purchase this software. Process priority management is at the core of this tool. Every app/program the user runs creates additional processes, and the CPU handles them one by one. Multitasking on slow CPUs can have a strong negative effect on performance. TuneUp is doing an excellent job of prioritizing new tasks over older ones and thus keeps it all running relatively smoothly. However, you need to be careful about which apps/tasks you put to sleep. Speed Up can, indeed, improve performance and make the battery last longer. But, if you prioritize every new process without closing the older ones, that can lead to some unwanted results. Make sure you don’t run 10-20 tasks at once and follow this tool’s suggestions blindly. Disable Startup Programs – offers the user to disable several starting programs to make the system start faster. Disable Background Programs – gets rid of processes in the background that aren’t running at this exact moment. Recommendations – asks the user a series of questions before coming up with a list of recommendations for optimizing the system. For clearing browser data and log files, freeing up the system cache and getting rid of duplicates, Free Up is an excellent tool. In many ways, it’s like a combination of several separate features that come together in TuneUp. You’ll also find an uninstaller, a quick tool for secure deletion of files/folders, and means to detect unusually big files and folders. The uninstaller isn’t very different from the built-in tool in Windows. With it, you’ll get some additional information about the installation size, but nothing more. Free Up will be of great help to owners of small drives (like a 250GB SSD). At the same time, don’t follow this tool blindly and be careful not to delete any important files. During our tests, it detected up to 15GB of “junk files” on our system. 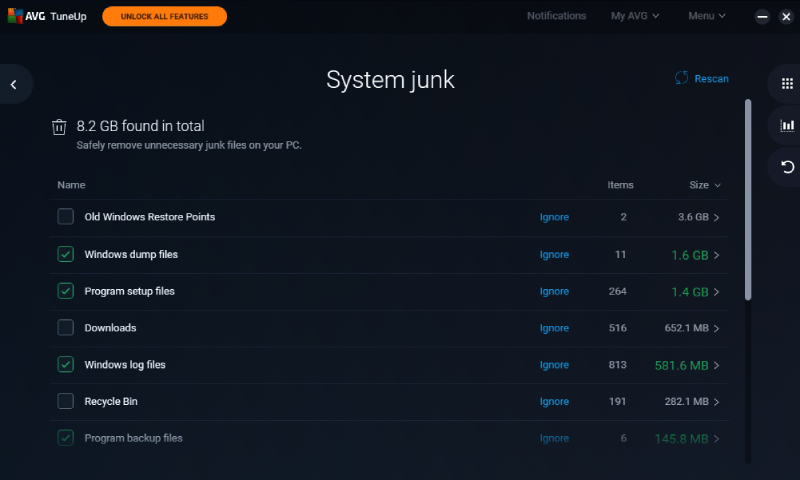 However, most of those files aren’t junk at all. Again, go through the list of files that Free Up wants you to delete before actually going ahead with it. System Cache/Logs – the same feature as in Maintenance. Remove Duplicate Files – runs a quick scan to find duplicates. The user is then asked to delete them. Find Large Files/Folders – runs a different scan to locate the biggest files and folders on the OS. 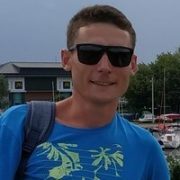 Uninstall Unused Programs – makes a list of the programs/apps that you haven’t used in a long time. Securely Delete Files – complete uninstallation of files (they can’t be restored after this operation). Strange fact about this section: in addition to Disc Doctor that comes built into TuneUp, it features AVG Driver Updater and a VPN that should be purchased separately. We won’t cover the advertised products in this review, as they are not the part of the deal. Speaking of Disc Doctor, it’s quite a handy tool for scanning. 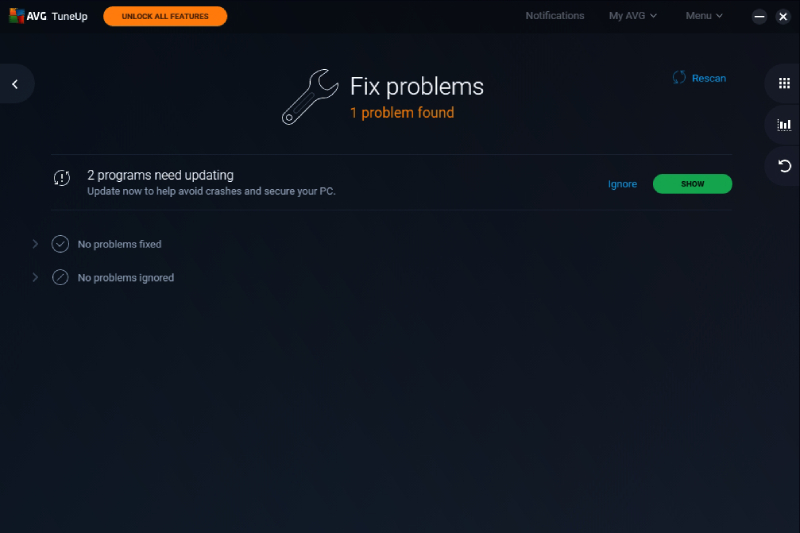 Besides, in the bottom left corner, you’ll find the Repair Wizard tool that excellent at finding and fixing hard-to-diagnose issues in older Windows systems. Restore Deleted Files tool takes a lot of time to scan the hard drive, but it’s very good at finding files that can be restored. In our tests, this tool did a fantastic job of bringing back files that we just deleted. Disc Doctor – finds a series of problems like the lack of an antivirus, network access to the OS Registry, and more. Plus, it offers ways to fix all those problems. Repair Wizard – deals with smaller concerns. For example, if the Recycle Bin is not being displayed on the desktop, this feature will remind you of that. Yes, all of these issues are interface- and files/folders-related. Repair Deleted Files – a general scan for restoring files and checking for standard errors. When you download this tool on the official website, AVG grants a 30-day free trial. During that period, you’ll have access to the paid version’s features. Once those 30 days are over, TuneUp will be automatically downgraded to the free version. Yes, there’s also a 100% free version that lacks some features but it still quite good. As you can see, there are no incentives for a long-time commitment. However, if you also purchase AVG Internet Security or Secure VPN, you’ll get significant discounts of up to 50%. The same is true for all the other AVG products: you’ll get impressive discounts if you buy two or more products together. If you need both an antivirus and a tune-up tool, consider getting the AVG Ultimate package. It combines AVG Internet Security antivirus features and TuneUp tool and will cost you $30 less than the two products purchased separately. This is it for our TuneUp review: we discussed pricing and all the available features. Summing up, we want to say that AVG created a handy and easy-to-use tool. Installation is straightforward: all you have to do is download the .exe file and follow the instructions. Compared to other optimizing tools, AVG TuneUp is a better choice in terms of pricing. Sadly, the full version is only available for the Windows OS (Win 7 to Win 10 are fully supported). For Mac and Android/iOS, there’s a free and simple tool called the AVG Cleaner. Again, brand-new computers with fresh operating systems don’t really require any optimization, to begin with. But, if you own a somewhat outdated device/system, you’ll see an improvement in performance with TuneUp.